Montecristo 10-Pack Free With Box Purchase! 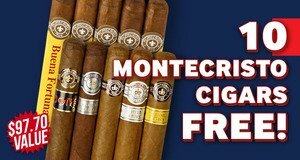 Buy a Box of Montecristo Classic, Montecristo Platinum Series, Montecristo Nicaragua, Montecristo, Monte By Montecristo, Montecristo White Series Vintage Connecticut, Montecristo Espada, Montecristo Epic, and Montecristo Pilotico Pepe Mendez Cigars, get 10 Montecristo cigars, valued at $97.70, absolutely FREE! You'll get 5 Montecristo Buena Fortuna, 1 Montecristo Classic Collection Toro, Montecristo White Toro, Montecristo Double Corona, Montecristo Platinum Toro, and Monte By Montecristo Toro cigars.